above is the outcome. 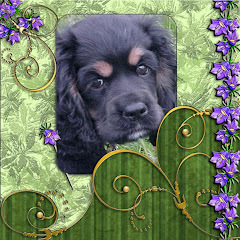 It has the same puppy pics but I used some different papers and elements from Robyn Littlejohn's Cottage Garden kit. I think this works well with the background items I chose from her kit. Well, I bit the bullet and ordered business cards for my new venture. 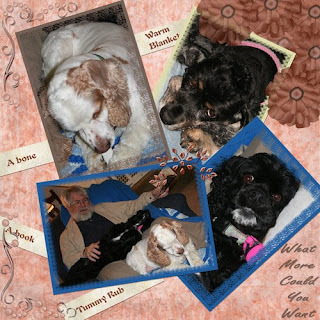 I'm going to start, or more to the point, try to start earning some extra money with my camera doing pet photography. I really have no idea where to begin, other than the business cards so if anyone has any pointers please drop me a comment. I have most of the camera equipment; ie: lenses, lighting a simple back drop. Maybe as time goes on I will invest in some more stuff but right now my focus is just on taking pictures and earning a little bit of money. Isn't life so unfair. You work your whole life to own a home and have a few nice things only to have everything ripped from you by the loss of income due to a stale economy. Why do we do this to ourselves? I'm sure greed has much to do with it, and yes, I'm guilty and now I'll be reaping my just rewards by losing my home and possessions and now I learn that friends are going through much the same thing. Yeah, we can find jobs (maybe, our age is against us) but what kind of a pay cut will we experience. In my case it will be huge because I am very well compensated for which I'm very thankful but I have been priced right out of the job market. My poor hubby is experiencing so much self doubt and depression and his faith is faltering and that worries me more than anything. He never has been strong in the faith dept anyway and now he's facing all this loss for the second time in his life and wonders where God is in all of this. I wish I had answers for him but all I can do is lift him up to the Lord and try to be strong for him. I just don't know how long I can hold up being the strong one, I'm almost at the breaking point the way it is. My friends, you know who you are, I hope all goes better for you and yours and I will be remembering your cares and worries in prayer. This has been a horrible week. Phil and I both learned that unless the economy improves within the next 45 days we will both be jobless. Like so many Americans, we are up to our eyeballs in debt and the prospect of job loss is quite overwhelming. As I sit here and write this, I have to admit, I'm scared to death...what the future holds, loss of jobs, loss of insurance, loss of a roof over our heads....I can't eat or sleep. I wish I could just shut my mind off for a few hours....and poor Phil, he is so depressed and worried. Oh well, need to get back to cleaning and getting this house ready to put on the market. Hopefully, we can get out from under it. Here is a frame for anyone who is interested. It will be available for 7 days. Just hover over the "Here is a frame" to get to the link. The title is from an Eagle's song. It pretty much sums up how I feel most of the time about life in general. It speaks of trying to find something satisfying in your life and never finding it and learning to be still while waiting. Sometimes that's really hard to do, but I have learned the hard way that being still is best. God can work wonders in your life when you do. It's the waiting that's hard. Our timing is not God's timing. Anyway, enough of that. Punkin went to the groomer today, I'm waiting on the call to come and pick her up. Dusty will be next. Maybe sometime yet this week hopefully. He seems to be feeling better and his temp is normal, so that's good. Sadie is doing great! I'm missing my kids so much right now. I'm going to be trying my hand at designing in the near future. I will probably start out by giving what I design away, so be watching for the links for downloads. Well, after several days of head banging and aggravation I finally did it! 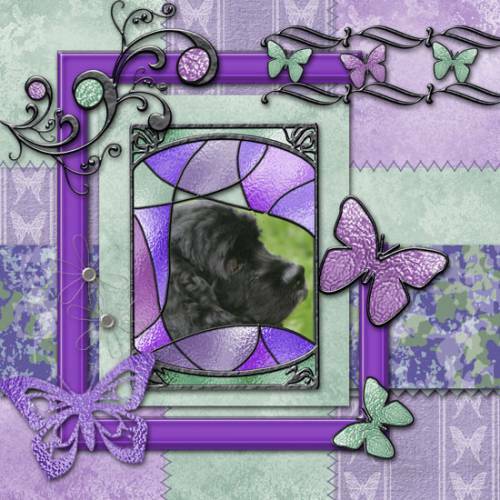 I used Robyn Littlejohn's Cottage Garden kit. I think for a first try it turned out pretty good. 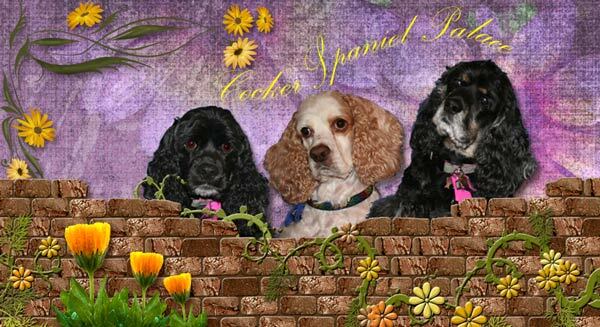 And yes.....it's still the Cocker Spaniel Palace, they hold the headline at the top in my header and all through the blog. On another note, Dusty is sick again. Poor little guy has a pancreas inflamation! He's not as sick as last time because I caught it a little sooner but his temp is really higher than it should be. Seems like there is always someone or something to worry about. Sadie goes to the groomer for her spring doo, today. I've been off since Wed (on vacation) and the three of them are getting so used to me being here. Oh, how I wish sometimes it could always be like this but I know, be careful what you wish for! Let me know your thoughts on this new design!